Reset oil service light Jeep Commander. Reset oil service light Jeep Commander. How do you reset maintenance light, reset service light indicator. Can be made manually by use button on car dash board. How do you reset oil service light Jeep Commander. Reset engine oil change indicator system Jeep Commander. Rest oil change required. Your vehicle is equipped with en engine oil change indicator system. The Oil Change Required message will flash in the EVIC display for approximately 10 seconds after a single chime has sounded to indicate the next scheduled oil change interval. The engine oil change indicator system is duty cycle based, which means the engine oil change interval may fluctuate dependent upon your personal driving style. Unless reset, this message will continue to display each time you turn the ignition switch to the ON/RUN position. To turn off the message temporarily, press and release the MENU button. 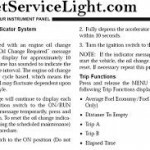 To reset the oil change indicator syste, (after performing the scheduled maintenance) refer to the following procedure. 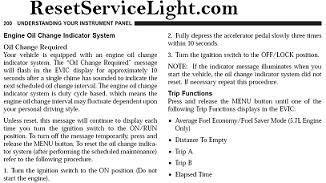 NOTE: If the indicator message illuminates when you start the vehicle, the oil change indicator system did not reset. If necessary repeat this procedure. All information is taken from the Jeep Commander owners manual. That it is the full procedure how to reset oil service light Jeep Commander. If you like to reset any maintenance oil light after an oil change. Or reset check engine light, airbag light, inspection key or insp errors when maint reqd, for Jeep cars. Or any warning light for service reminder which appears on the display. Write in the search box the car name for which you want to find information, and find how to reset other service reminders when by yourself.